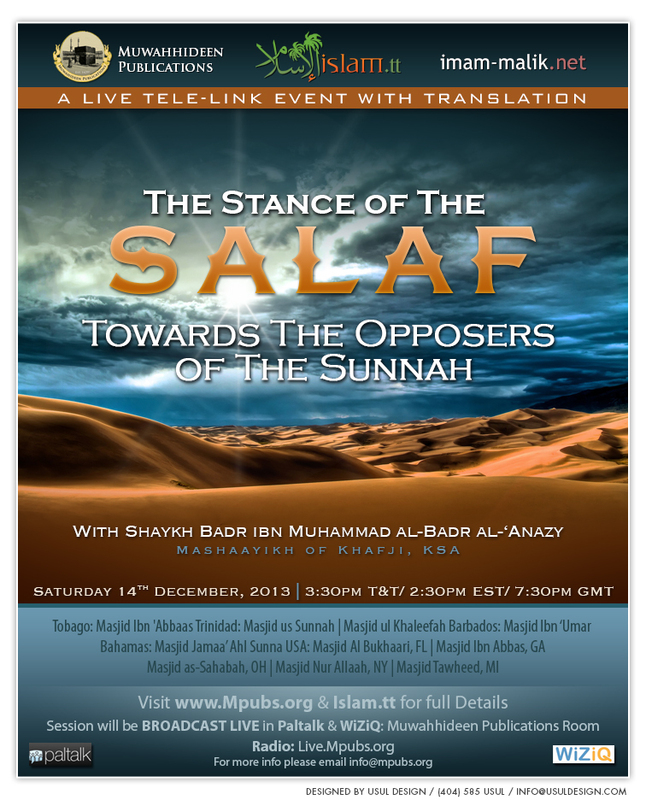 Muwahhideen Publications and Islam.tt in conjunction Imam-Malik.net is pleased to present a LIVE Tele-link Lecture with the Noble Shaykh Badr Ibn Muhammad al-Badr al-‘Anazy (May Allah Preserve Him) on Saturday 14th December 2013. Shaykh Badr from amongst the mashaayikh of Khafji, KSA and is a student of Shaykh Saalih al-Luhaydaan and Shaykh Saalih Suhaymee. This event will be broadcast LIVE in Masjid Ibn 'Abbaas, Tobago, two masaajid in Trinidad, Masjid ul Khaleefah and Masjid us Sunnah, and five masaajid in the U.S. Masjid Al-Bukhaari, Florida, Masjid Ibn 'Abbas, Georgia, Masjid Nur Allaah, New York, Masjid as-Sahabah, Ohio and Masjid Tawheed, Michigan.